While it can seem like your daily to-do list is endless, take a step back and remember that the success of your nonprofit organization starts the same way as a billion-dollar corporation—with a solid plan. However, a successful fundraising calendar consists of more than just a year’s worth of campaigns and events. In order to maximize your organization’s impact and identify the most strategic campaigns and timeline, you need to have a holistic understanding of your donors, define the big picture of your organization, and identify your challenges and opportunities. 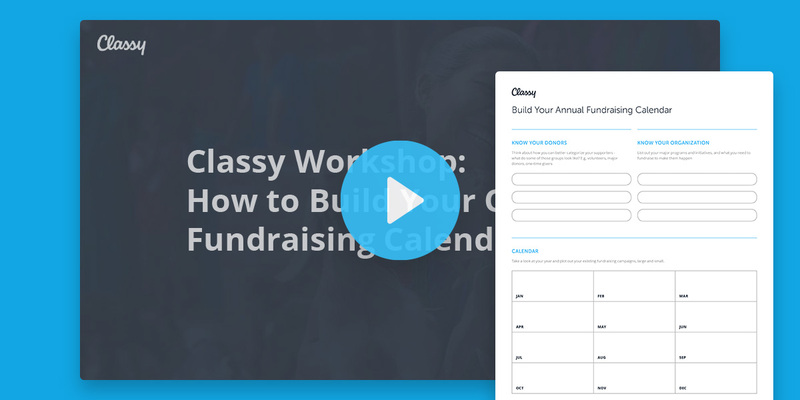 We understand that this is a big undertaking, so we’ve created a worksheet and webinar to help you create your annual fundraising calendar. Download the worksheet and then check out the webinar below, where two Classy account managers will help you build out your calendar step by step. In addition to walking you through the worksheet, they will provide campaign suggestions, tips, and best practices for making your calendar last. Take the time now to prepare for your upcoming year and you’ll be able to spend your days focusing on what’s most important: making progress with your cause.